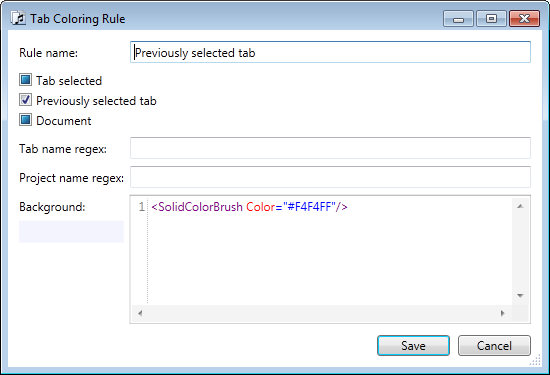 Trying to reduce necessity to manually craft a XAML style, I’ve added presentation parameters and tab coloring rules to Tabs Studio. 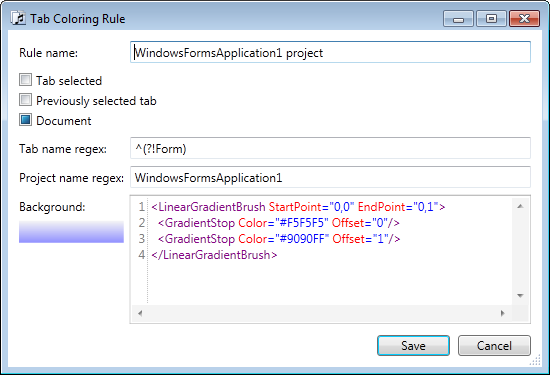 While a custom XAML style allows seamless integration of different visual adornments together, it takes some time to make it right. Presentation parameters are a new layer between a default style and a custom style. 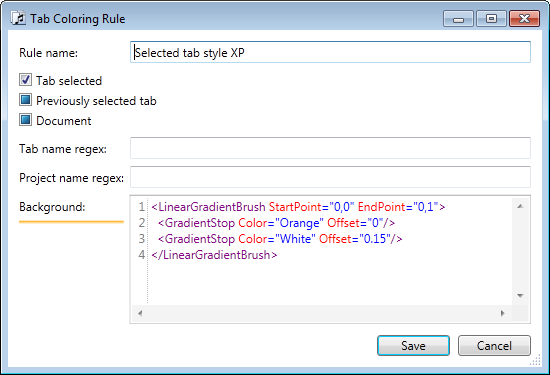 It implements most common style options thus simplifying a custom XAML style. 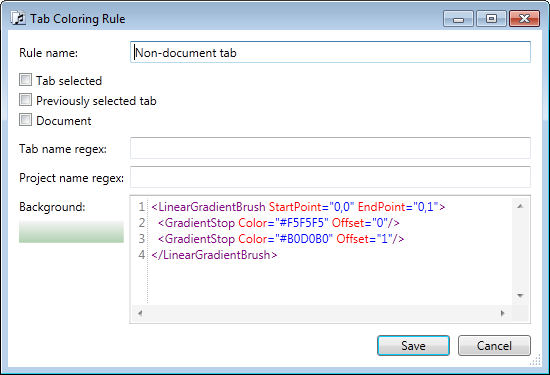 A tab coloring rule has 5 filtering options and a definition for a tab background brush. 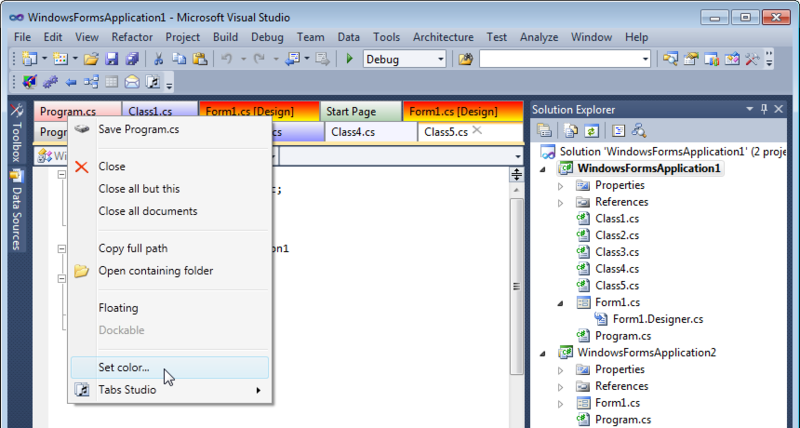 Checked boolean options apply the rule to tabs with the corresponding property set to True (e.g. IsTabSelected), unchecked – to False and undefined – to all tabs. Regular expression options apply Regex.IsMatch with the corresponding property (e.g. TabName) when the regex is not empty (see Regular Expression Language Elements MSDN page for .NET regular expressions details). Two more examples. 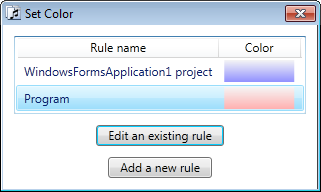 The Forms rule applies to tabs with the name starting from Form when this tab is not selected and not previously selected. 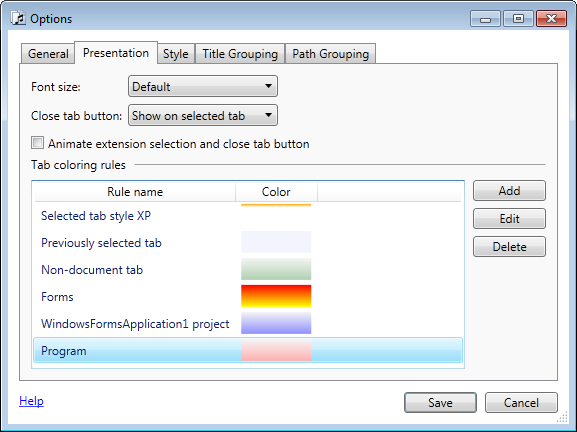 The WindowsFormsApplication1 project rule applies when tab’s project name contains WindowsFormsApplication1 and tab name doesn’t start from Form. Tab background definition must be a Brush descendant. 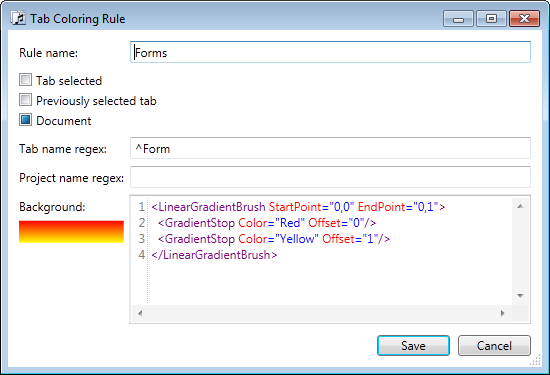 Different options to specify a color in XAML are listed on the Color documentation page.